I always seem to find beautiful artwork on the Web completely by accident. 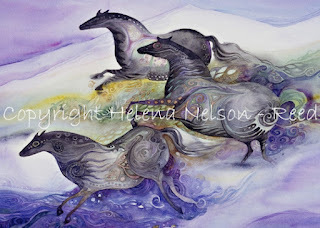 Such is the case with the luminous and ephemeral art I stumbled upon by watercolor artist, Helena Nelson-Reed. When I found her Ghost Dancer painting the other day, I was blown away. 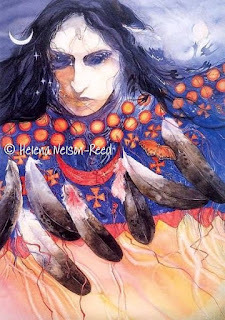 I emailed Helena right away to seek permission to use some of her images, so that I could spotlight her beautiful artwork here on Native History Magazine. About Ghost Dancer, Helena said, "I created it after dancing for my brother during his 8th year of Sun Dancing. Sun Dance is different from Ghost Dance, of course, but the immersion, discipline and intensity of prayer focus is much the same. I can only imagine how those Ghost Dancers must have prayed with every fiber of their being." Much of Helena's work is rooted in myth, fairy, folk and spiritual lore, and is often native-inspired. Her father was one-half Pawnee, so she is undoubtedly touched by her own native roots and heritage. The detail and passion put into each of her paintings is amazing, and it is often beautifully connected not only to the environment, but also to the life force of all beings, and life experiences. 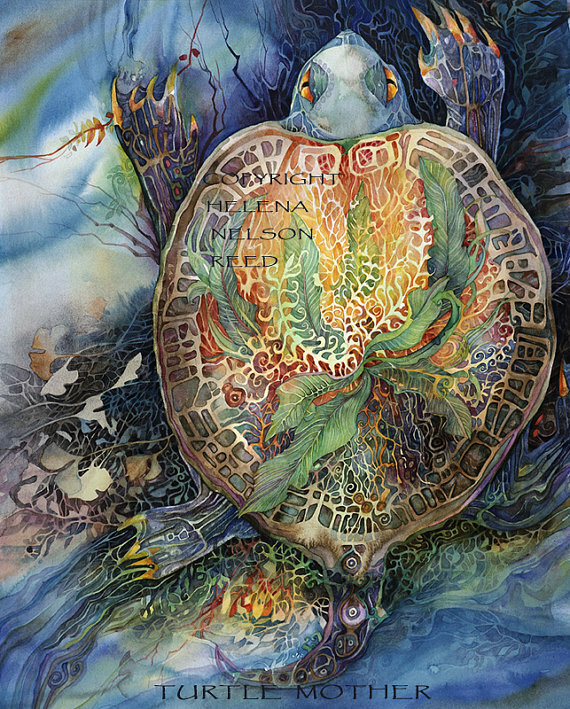 The Turtle Mother painting is one of my favorites. It instantly made me think of my mother, creator of Native History Magazine, because she so loved turtles. I wish I'd found this painting while Mom was still alive...I would have bought it for her. Helena's work is in private collections, and has also been featured on book covers, magazines, and CD covers. She also has a line of fabulous jewelry, calendars, and even greeting cards. You can see many more of Helena Nelson-Reed's artworks on her website, and in her Etsy shoppe. I extend a heartfelt thanks to Helena for being so gracious to allow me to feature her images here on NHM. I look forward to seeing where her inspiration leads her next. Overview: These inspiring true stories illuminate the courage and wisdom of five 19th-century Native leaders and famous Métis who fought against impossible odds to preserve the culture and rights of their people. The visionary Cree leader Big Bear sought peace and a better life, only to be hunted mercilessly and imprisoned unjustly. Jerry Potts, the legendary North-West Mounted Police guide and interpreter, helped smash the whiskey trade and negotiate treaties. Persevering through sorrow and defeat, these brave and steadfast men left a lasting mark on Aboriginal culture and the history of western Canada. Chief Crowfoot (Isapo-Muxiha) is featured on the cover of this book. 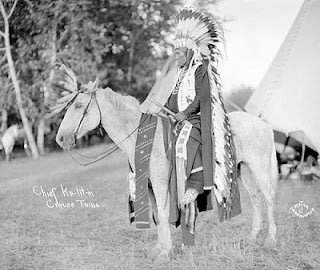 Crowfoot was born in 1821 and was the chief of the Siksika First Nation. He was also known to be a great warrior and orator, and he was greatly respected for his leadership and bravery. Though he fought in 19 battles, he was also well known as a peacemaker who viewed peace as the key to survival. 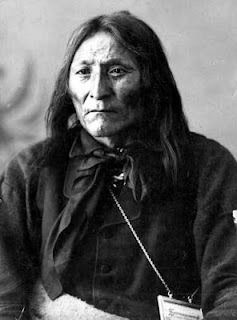 Crowfoot died from Tuberculosis at Blackfoot Crossing, on April 25, 1890. Clicking on the book's title will take you to its location on Amazon. A little while and I will be gone from among you, whither I cannot tell. From nowhere we came, into nowhere we go. It is as the little shadow that runs across the grass and loses itself in the sunset. I want to share some resources I've found that provide a variety of Native American Legends to read, enjoy, and share. 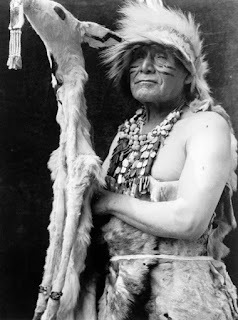 These are just a handful of resources that I've found on Native American Legends. There are many others that can be easily found with a simple Google search. But I hope you will find these useful, and a good starting point for further research and reading. After reading our post about the Legend of the Apache Tears, you may also be interested in a Lesson Plan on the same subject. Click on the Lesson Plan title to view the full lesson plan at its source. This lesson plan is geared toward Grade 8 and includes objectives for Reading Process, Literary Text, and Informational Text, but it could easily be integrated into a History lesson as well. 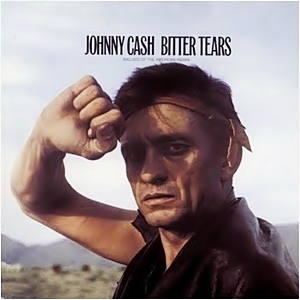 It includes a good narrative of the Apache Tears lesson, and it also incorporates the Johnny Cash song, Apache Tears. The song was written for his album, Bitter Tears (Ballads of the American Indian). The lesson plan is offered on the website of the Arizona Department of Education. 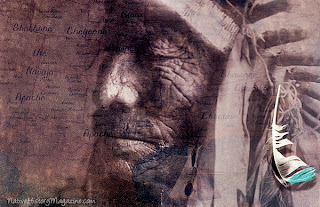 Once when I was little, my mother told me a story...the Legend of the Apache Tears. I believe I was in third grade at the time, and I remember being so moved by the story that my mother told me. The reason she told me the story was because she had a bracelet that she called Apache Tears, and I wanted to take that bracelet to school for Show & Tell. She told me that I would first need to know the Legend of the Apache Tears so that I could share it with my class. Mom told me the story of 75 brave Apache warriors who were camped on a mountain, and who were attacked by soldiers of the U.S. Cavalry. In the sneak attack, 50 of the Apaches were killed within minutes, while those that remained retreated to the edge of a cliff. Realizing that they had nowhere to go, the remaining warriors chose to leap to their death, rather than to die at the hands of the white man. When the women and children discovered their beloved husbands, fathers, and sons dead at the bottom of the cliff, they began to weep. And as their tears fell, black stones were formed on the white, sandy earth for every tear that hit the ground. These are Apache Tears. 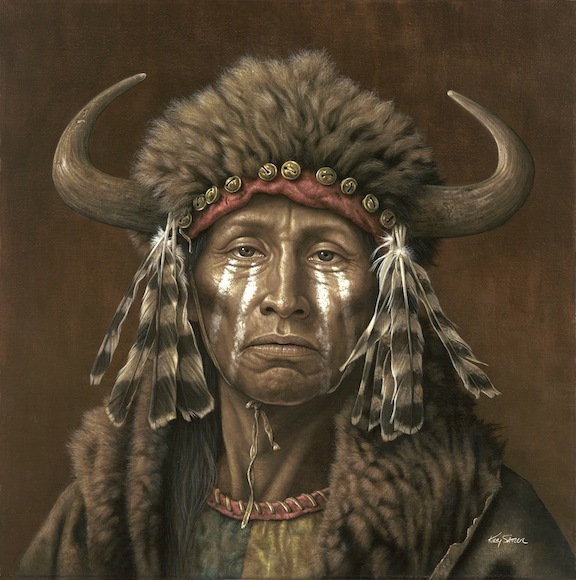 Legend has it that anyone who has any of the stones, the Apache Tears, should never need to cry again...because the Apache women cried enough tears for all who mourn. Some believe that the stones themselves carry spiritual and healing powers. Mom's bracelet had Apache Tears (Obsidian) all the way around it on a silver chain base. I wish I'd found this bracelet after Mom passed away last year. Sadly, I didn't, but I never forgot the Legend of the Apache Tears. Robert H. Ruby and John A. Brown, the authors of this book, tell the story of the Cayuse people, beginning with their early years and spanning through the nineteenth century, when the tribe was forced to move to a reservation. The book was first published in 1972, but it was expanded in 2005 to commemorate the sesquicentennial of the treat between the Cayuse, Umatilla, and Walla Walla Confederated Tribes and the U.S. Government on June 9, 1855, in addition to the bicentennial of Lewis & Clark's visit to the tribal homeland in 1805 and 1806. Clicking on the book's title will take you to its location on Amazon.com. This is a photo of Chief Ka-Lit-In of the Cayuse Indians of the North American Plateau. It was taken by Lee Major Moorhouse, circa 1900. The Cayuse people lived on the Columbia Plateau in what is now southeast Washington and northeast Oregon. They call themselves the Tetawken, which means, 'we, the people.' They were famous horse breeders, and the small breed of horse, the cayuse "indian pony," is named after this group of Native people. They were also noted by early explorers for the bravery, and for using their riding prowess to intimidate other tribes. By 1855 the Cayuse had settled on the Umatilla Reservation near Pendleton, Oregon. By 1990, they were among the smallest of tribes in the United States, numbering only 126 members at that time. You can read more information about the history and culture of the Cayuse Indians on the website of the Confederated Tribes of the Umatilla Indian Reservation. 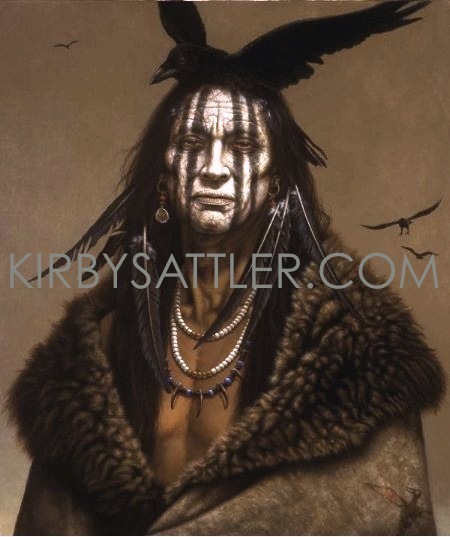 I happened upon the website of an amazing artist today named Kirby Sattler. 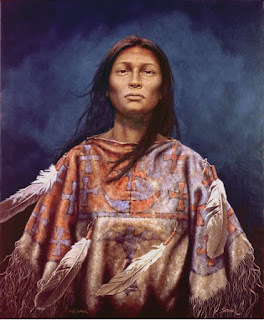 Mr. Sattler creates Native American Art Prints, which are American Indian Portraits-art interpretations, and they are simply breathtaking. When I saw them, I emailed immediately to request permission to feature Mr. Sattler's work here at Native History Magazine. 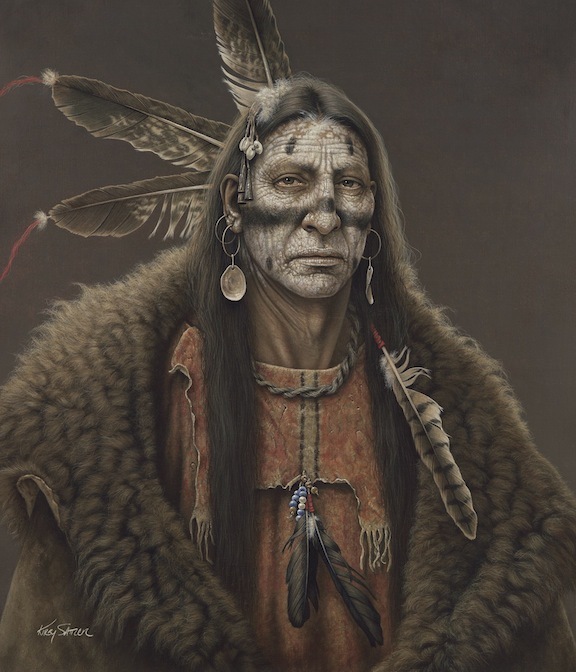 Mr. Sattler's work is fueled by an inherent interest in the Indigenous Peoples of the Earth. The current images evolve from the history, ceremony, mythology, and spirituality of the Native American. The ultra-detailed interpretations examine the inseparable relationship between the Indian and his natural world, reflecting a culture that had no hard line between the sacred and the mundane. Each of his paintings function on the premise that all natural phenomena have souls independent of their physical beings. Under such a belief, the wearing of sacred objects were a source of spiritual power. Any object--a stone, a plait of sweet grass, a part of an animal, the wing of a bird--could contain the essence of the metaphysical qualities identified to the objects and desired by the Native American. This acquisition of "Medicine," or spiritual power, was central to the lives of the Indian. It provided the conduit to the unseen forces of the universe which predominated their lives. Mr. Sattler attempts to give the viewer of his work a sense of what these sacred objects meant to the wearer; when combined with the proper ritual or prayer there would be a transference of identity. More than just aesthetic adornment, it was an outward manifestation of their identity and their inter-relatedness with their natural and spiritual world. Beneath each of these images of Mr. Sattler's beautiful work is the artwork's title. Clicking on the title will take you directly to his website. These images are all Copyright Kirby Sattler, used with permission. Note: Make-up for Johnny Depp's character portrayal of Tonto in the upcoming film, 'The Lone Ranger' was inspired by this amazing painting. Mr. Sattler's work pays beautiful and respectful homage to Native Americans. He calls his paintings 'interpretations,' based on the nomadic tribes of the 19th century American plains. His subjects are inspired by a combination of visual references and his imagination. He produces a limited number of paintings each year; and his limited edition prints are available on both canvas and watercolor paper through his website. You don't have to purchase the prints to be amazed by their detail, depth, and true beauty--but I do hope you'll visit his website and explore his wonderful collection. There is far more to be seen there. My mother would have loved these works by Kirby Sattler. I deeply thank him for allowing me to share them here at Native History Magazine. 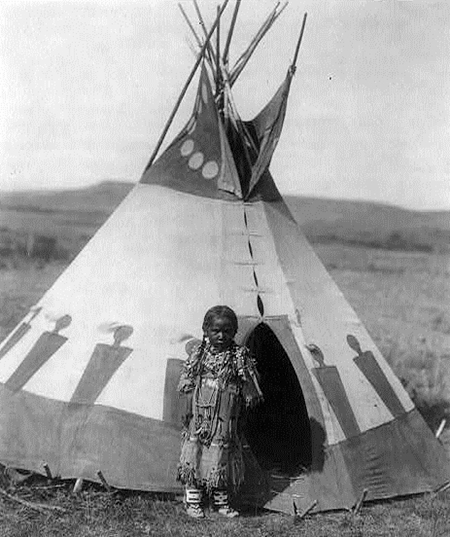 This photo is from the Edward S. Curtis Collection at the Library of Congress. It is described as a Hupa Indian, half-length, standing, facing left, in ceremonial costume. The Hupa (also Hoopa) are native to northwestern California. 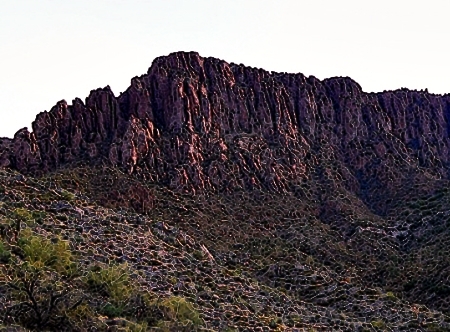 Known as the Natinixwe, their name means "People of the Place Where the Trail Returns." Clicking on the photo's title under the photograph will take you to the original photo at the Library of Congress. You can learn more about the history of the Hoopa people by clicking on the link below. That is the official website of the Hoopa Valley Indian Tribe, where you can also learn about their Culture, Language, Art, Government and more. This photo is from the Edward S Curtis Collection at the Library of Congress. It is described as a Piegan girl standing outside small tipi.